Macy Jackson packs food as part of the Gleaners BackSacks program. Tomorrow, many people across the city of Indianapolis and state of Indiana will enjoy tasty treats with their family and friends for Thanksgiving. For junior Macy Jackson, she’s thinking not only of the food awaiting her, but of others who may not receive a meal that day. 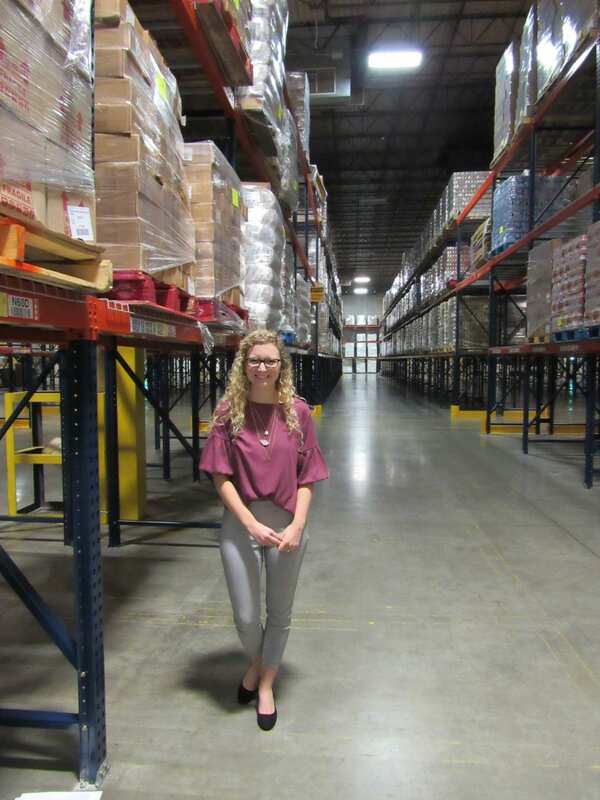 Those thoughts have fueled her to find ways to address food insecurity through an internship at Gleaners Food Bank of Indiana. Jackson’s passion for food insecurity and involvement with Gleaners began in middle school when she volunteered as part of her summer camp with the organization. With her interest piqued, she later helped organized a project through her high school that created around 200 laundry baskets full of Thanksgiving meals for people in her community. “It’s come full circle. I started as a volunteer at Gleaners, became more educated on food insecurity, became passionate about it when I was in school, learned how to fundraise in college, and now am working as an intern to become more of a part in the cause,” Jackson explained. Jackson analyzes a past grant proposal. 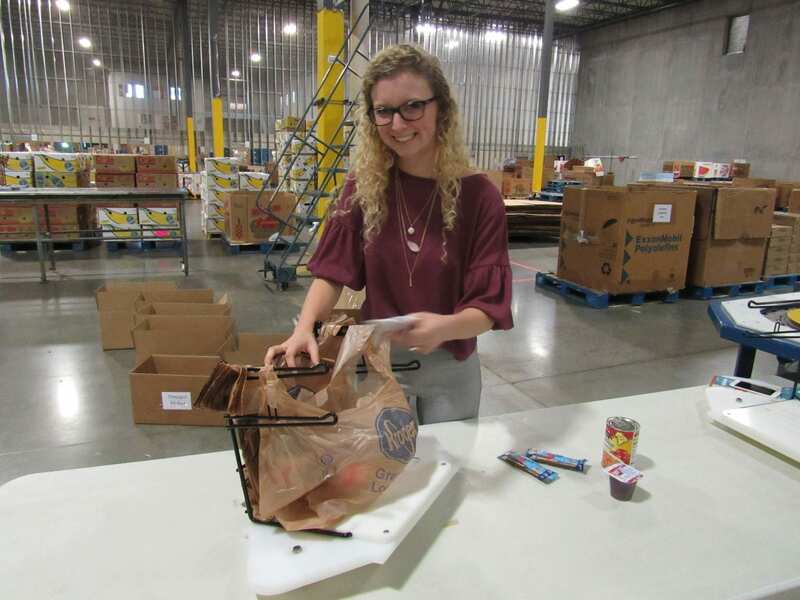 Her internship in the grants and foundations department at Gleaners has shown Jackson another aspect of fundraising, the career path she wants to pursue after graduating. 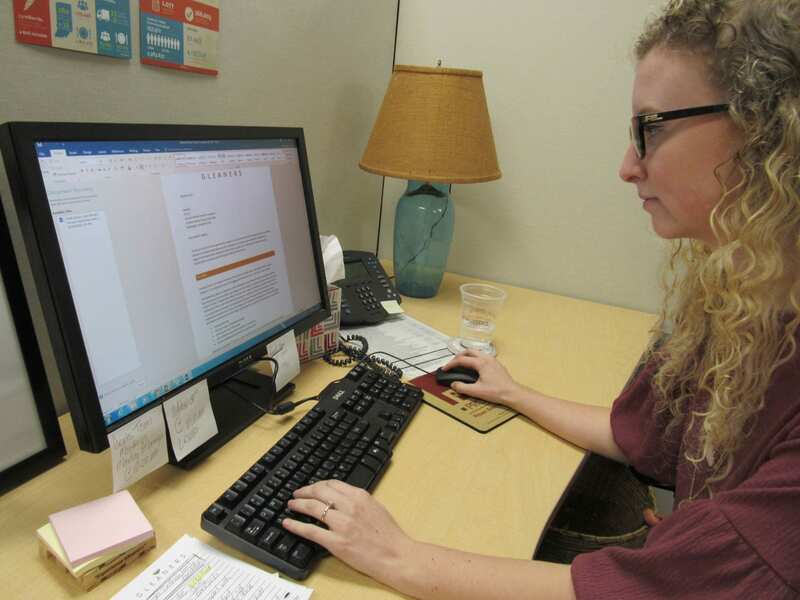 Her role this fall has included reading and analyzing all of the past grant reports that Gleaners staff have written and gathering the best information in one place, which will help current staff utilize that information for future grants. She has also written grants, a practical skill Jackson knows will be useful when she begins looking for full-time work. Savanah Strever, director of grants and foundation relations, shared her thoughts on the benefits of having Jackson as an intern. “Having Macy on our team has allowed us to tackle several projects that otherwise may have been put on the backburner. She helped create systems and tools that will improve efficiency, ultimately resulting in increased fundraising capacity for those in need,” Strever said. Jackson’s desire to pursue fundraising as a career helped her earn her internship in the first place. “I was in the Introduction to Fundraising course with Bill Stanczykiewicz (assistant dean for external relations and clinical associate professor), and he knows Gail Lowry, the chief philanthropy officer at Gleaners,” Jackson said. “He knew I was looking for an internship in grants and connected me with the one at Gleaners. Her involvement doesn’t stop at Gleaners, though. Jackson is also the Director of In-Kind Partnerships with Jagathon, IUPUI’s Dance Marathon that benefits Riley Children’s Hospital. She works with corporate partners who donate items for Jagathon. She’s also a supervisor at the IU Natatorium and a volunteer with Paws Pantry, which gives food to any member of the IUPUI community, especially students, who need it. Jackson also serves as a Sam H. Jones and Cox Scholar. “I try to stay heavily involved and take advantage of my student experience!” Jackson explained. Even with all of her philanthropic activities, Jackson didn’t arrive to campus as a philanthropic studies major. “I arrived at IUPUI intending to pursue nursing,” she said. “I didn’t know how I wanted to help people, but I knew I wanted to help others. Jackson met with Pamela Clark, director of student services and admissions, and realized that she could become more educated and learn from practitioners and researchers in the field while also honing her leadership abilities. In the future, Jackson plans on working in fundraising and connecting donors to causes they care about. “I’ve always enjoyed getting donors involved and helping them learn about all of the different ways they can integrate themselves into an organization,” she said. Jackson in the Gleaners warehouse. She credits the Lilly Family School of Philanthropy faculty, staff, and fellow students with encouragement and support along the way, and encourages those with a passion for helping people to consider philanthropic studies. “I loved how helpful the school and multiple different faculty members were for me to earn an internship,” she said. “In addition, there are so many different paths you can take with philanthropy. If you have a passion for helping and caring for others, then definitely look into this major. Wow, Excellent blog. This post has covered so many topics about philanthropy. Thanks for sharing.